Solid Oak Software, a company which provides Internet filtering products for parents and others, announced today a new program designed to block access to select popular social networking sites. 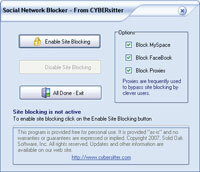 CyberSitter Social Networking Blocker is available now for free personal usage. CyberSitter Social Networking Blocker, said Solid Oak, is designed to block unauthorized access to MySpace and FaceBook. It also blocks access to several hundred known Web proxies that can be used to bypass filtering programs.